We envisioned an autonomous vehicle that produces its energy consumption, by exploiting the sun and making passengers active in its motion. 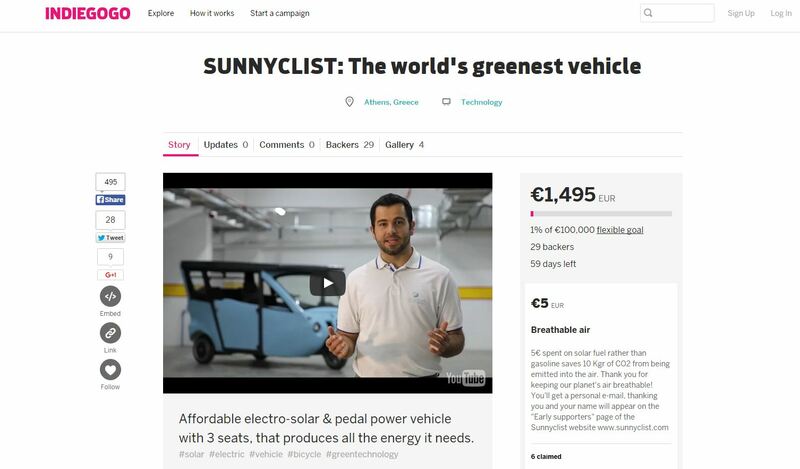 Sunnyclist represents an attractive and affordable solution of modern people for green mobility, with minimal costs, autonomy, no environmental pollution and without infrastructure commitments. Here is our teaser for the crowd funding campaign,that we will launch on November 16 on Indiegogo.com.We hope you like it! Help us spread the word and help make it happen! Hey Buddy!, I found this information for you: "Sunnyclist is the greek solar vehicle, that produces its energy consumption! Help make it happen!". Here is the website link: http://sunnyclist.com/sunnyclist-is-make-it-happen/. Thank you.